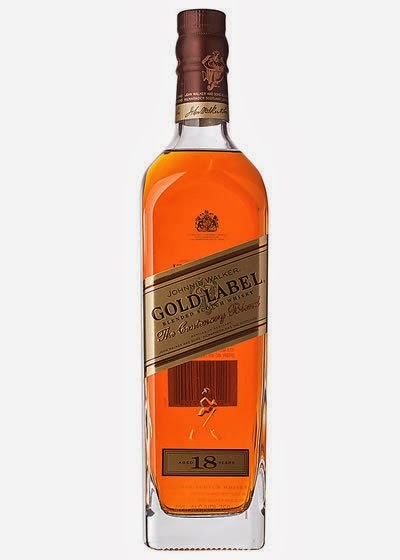 Johnnie Walker Gold Label 18yo (40.0%): Oh, the old good 18 year old Gold Label... It used to be my all time favorite Johnnie Walker expression and I still mourn the loss of it. It's been a while since Diageo announced that they will be killing the Gold Label 18yo and it's being harder and harder to spot this beauty on the shelves. Don't be surprised when Gold Label 18 yo bottles start to be sold in auctions all over the world for crazy figures in a few years. That's why I want to thank immensely to my friend Soner Tunay who offered this bottle from his whisky cabinet to me right away after he realized how much more I like this blend than he does. He just wanted to see the bottle enjoyed... Isn't it great? Color: Like it is written on the label: Shining yellow gold. Nose: Orange blossom honey, moist fruit cake clementines and candied apricots. Whiff of seaside bonfire smoke and cold ocean spray. Rose petals, malted barley and hard wood shavings. Palate: Honeycrisp apples, bosc pears, eucalyptus drops and wild flower honey. Pretty strong but not overpowering sweet peat, crispy cereals and candle wax with some soapy notes: Must be the Clynelish... Cinnamon, ground cloves and candied ginger. Nice thick mouthfeel despite its low abv. Finish: Long with sweet cinnamon, smoke and honey syrup. Actually it is way longer when chilled like they suggest. Overall: Bummer... It makes me really sad to think that this beautiful blend is gone. It is a great whisky and well worth to look for it around. I am pretty sure a lot of liquor shops around the country still have a bottle or two hidden in a corner. Meanwhile I will try my best to savor my bottle as long as I can. Again many thanks to Soner for offering his bottle to me. By the way I actually should try the new Gold Label Reserve and The Platinum Label sometime. I still didn't have a chance to do it and very curious.